Trust me, I used to call myself the wooden lady- every creak and groan was owned by me and I would outwardly laugh it off but inside it annoyed me because I wanted to play in the Yoga studio and knew that there were many benefits to gain by taking regular classes. Not being flexible enough to start is simply an excuse we might use to cover up the fact that we feel inadequate, intimidated and really apprehensive about joining in something that is unfamiliar to us. “Oh I used to do Yoga and was really flexible but I’m older now and can’t do it”. This is something I often hear at BBQ’s and general conversation with people. The benefits of Yoga are more far reaching than just gaining more ‘stretch’ in our bodies but the lack of could be just the thing that prevents us from experiencing the magic of Yoga. Just turn up. Book your class, set your alarm, get your comfy clothes ready in preparation and then turn up to the mat. Just by stepping into the studio you will start to feel the vibe- calm, nurturing, focused and a sense that you are on to something good. This is not always possible to have long in depth conversations however a great idea is to let the teacher know in advance that you feel very inflexible and not sure that you can do much. A competent Yoga teacher will offer reassurance that you will be fine and encourage you to focus on yourself and the guidance he/she offers. You will also be discouraged from looking around the room at other students and resist any comparison. Your breath tells you a lot of stories about what is going on so listen and observe how it changes. If you are overdoing it then you will notice your breath might become rapid, choppy and feel uncomfortable. You might also hold your breath at times if you are challenging yourself too much or have lost concentration. Each breath should help to guide your physical movement with ease and a natural flow. 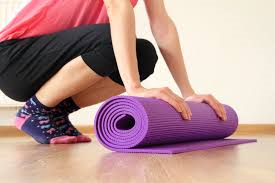 Don’t be afraid to bend your knees particularly through any of the standing postures and Downward Dog. Forward bends are a classic time to bend as much as you need to and the hamstring/lower back flexibility will gradually improve over time. Be patient. This is a great one which I resisted for so long as I believed I could struggle through without the help of a prop. Blocks are terrific to use to help us in seated postures, assisting with a slight lift to the pelvis particularly for those of us with tight hips. They are great for under the knees in any of our laying down poses and also in our standing balances when the block is used as an extra support while we build our strength. Bolsters and Straps are also there for our comfort and convenience so please use them as much as you need to. A Bolster is wonderful under the knees during savasana giving a little relief to the lower back if needed. Rest is always there for us on the Yoga mat so take it when you want to. A great Yoga teacher will encourage this and you will definitely never be challenged for taking a rest because after all it is your practice and you are in charge!